You also get Tai Cheng equipment: strength band, Tai Cheng Foam Roller, floor tape measure, and FREE access to the Team Beachbody online community. Includes 4 workout DVDs, "Get Started" Master Scroll DVD, Guidebook, Nutrition Guide, weekly calendar, quick start guide, and bonus DVD: Applied Travel and Sport. Promote healthy fat loss, improved circulation, coordination, balance, and range of motion while reducing stress. Improve your energy, balance, and agility while reducing many common aches and pains. Tai Cheng is a natural solution designed to rid you of many common aches and pains that may be holding you back from enjoying lifelong activity. It combines 21st-century fitness science with the centuries-old techniques of Tai Chi to help reduce joint and muscle pain through better muscle control. The real breakthrough behind Tai Cheng is a rapid learning technique called Dynamic Motion Control-that teaches you to master the 18 fundamental moves of Tai Chi in just 90 days. 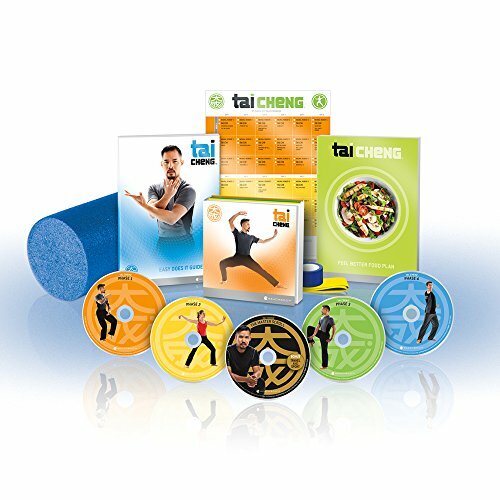 Every day, Tai Cheng takes you through a gentle, energizing warm-up and focuses on a unique Tai Chi move. Then, in phases, you'll learn to put the moves together into sequence. You'll also practice breathing and meditation, proper nutrition and resistance moves with the strength band you'll receive. Plus, you'll even learn how to massage away everyday aches and pains using the foam roller included in your kit. This 13-week regimen delivers tremendous benefits, whether you're a beginner starting out with the first-level moves, or you're an elite athlete who's looking to improve your athletic performance or work through an injury in safer, more holistic ways. You'll experience increased balance and strength, improved joint function, a wider range of motion, less stiffness, greater flexibility and an overall feeling of natural energy and well-being. Dr. Mark Cheng, the creator of Tai Cheng, is a martial arts master trainer with 3 decades of experience in Tai Chi. His background as a traditional Chinese medicine practitioner and a physical therapy-based corrective exercise expert have allowed him to observe movement patterns in his patients to identify the root cause of pain and assist them using specialized treatments such as Tui-Na manual therapy, corrective exercises and acupuncture. Today, his patients include PGA golfers, pro football players and MMA fighters, as well as celebrities and entertainment personalities. Now he's here to help you through Tai Cheng.